The F-104 was originally designed as a supersonic superiority day fighter. It was produced in two major versions: a tactical fighter armed with a six-barrel M-61 20mm Vulcan cannon; and a day-night interceptor equipped additionally with heat-seeking Sidewinder missiles. It also had a limited ground-attack capability. Development of the F-104 began in 1952 and the first XF-104 made its initial flight on 5 March 1954. On May 16, 1958, an F-104A set a world speed record of 1,404.19 mph, and on December 14, 1959, an F-104C set a world altitude record of 103,395 feet. The Starfighter was the first aircraft to hold simultaneous official world records for speed, altitude and time-to-climb. The F-104D was a two-seat combat trainer version of the F-104C. It was modified by having the nose wheel gear retract rearward and by removing the 20mm gun to make room for the second cockpit. The USAF procured 300 Starfighters, in addition, more than 1,700 F-104s were built for various allied nations. The F-104 saw combat during the Vietnam War. This two-seat F-104D, S/N 57-1331, was last flown by the Air Force Flight Test Center at Edwards AFB, CA in support of the X-15 program. Only 21 F-104Ds were produced for use by the USAF. 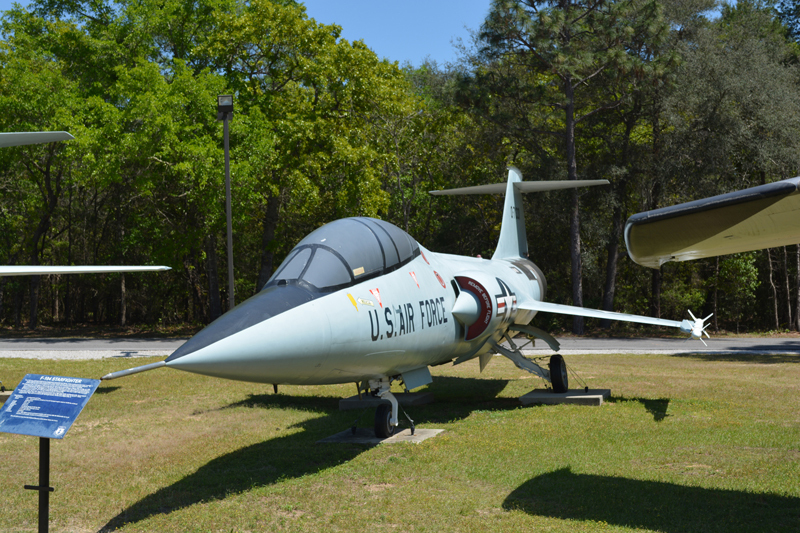 Eglin AFB, FL had 22 F-104As assigned here. They were converted to QF-104 target drones, all flew out of Eglin AFB, Fl.